There is a legend that the waters around Pulau Jarak are bewitched. And woe to the fisherman or diver, which is disrespectful to catch fish around Pulau Jarak. My instructor told us of a diver, who was catching fish underwater ruthlessly. Once above water, he claimed to have seen a female spirit who had bewitched him. When he was under water, he heard the female spirit calling his name. Back in the city, he became seriously ill and he could only recover, when he vowed never to fish or dive again. At the highest point of the island is a lighthouse. On our trip to the top of Jarak Hill is a strange stillness in the air. Our path was overgrown with creepers. There was an old tree on our path, which was fallen across the path on our trip to the lighthouse beyond. We wanted to continue our trip to the top, but we couldn't pass the fallen tree. It seemed we had to return to the boat. Suddenly we saw a way through the branches of the tree to climb, like someone showed us the way. We made sure that we did not harm any plant or an insect. That's why we were not really surprised that despite the many bugs and ants crawling over our body, none of us had a scratch or bite, while we pushed away the shrubs and creepers. Here were the key words "humility and respect for the environment" in its place. We were rewarded with breathtaking sea views from the top of the hill. Then we climbed the lighthouse. There were many sea eagles and other birds in the air. With the wind in our faces and cries of eagles in the sky we enjoyed the surroundings. Military is the island of importance, because it is strategically located in the Strait of Malacca was. Today, environmental group rings are worried, because the island is increasingly visited by divers and anglers. 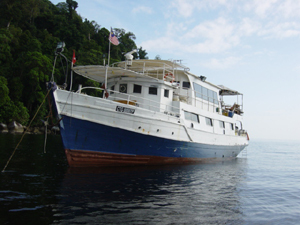 Ten years ago the island was visited by a group of the Topographical Service of Malaysia. They had to make a map of the island and some had to camp there for 2 nights. They didn't like it at all. Especially, when a storm came and they had to stay an extra day on the island. The island is increased as a pinnacle up out of the water. Around the island you will find various types of hard and soft corals, which provide protection to the smaller fish. The fish that hunt these little fish are not far away. The enchantment underwater with its brightly colored corals is beautiful. 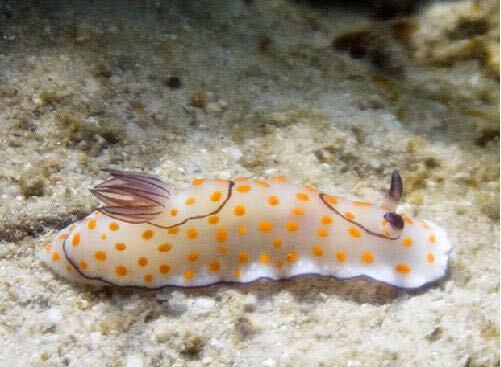 You see underwater many other sea creatures in a large variety of colors, shapes and sizes. 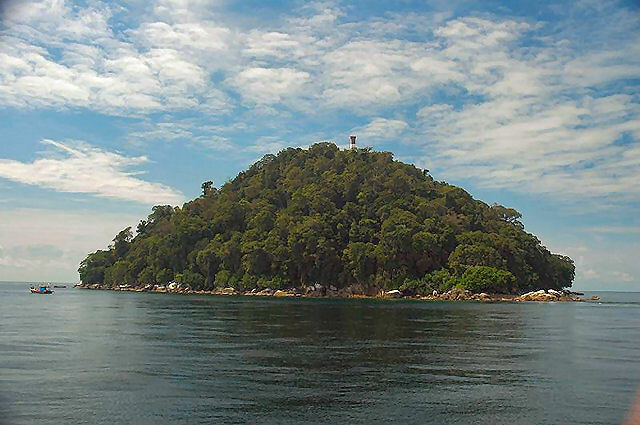 The lure of this island beckons divers through his mysterious and amazing underwater world, which Pulau Jarak offers. Divers can enjoy the coral, gold snappers and moray eels. There are divers who come to the island, when the monsoon is on the east coast and they can't dive there anymore. If visibility on Tioman or the Perhentian only 3-5 meters, one can still enjoy the rich underwater life here at Pulau Jakar. At night you can the fishes in the spotlight under the boats. Those, who are interested in recreational night fisheries, after diving during the day, will not be disappointed. Pulau Jarak is a unique island in the middle of the Straits of Malacca, which is fully covered with lush tropical forest ... really green in the middle of the sea. Kaleebso Diving is succeeded in getting permits from the port authorities (Jabatan Laut Office in Bagan Datoh) for fishing trips or diving trips to Pulau Jarak. The town Bagan Datoh is just a 2.5-hour ride from Kuala Lumpur on the coast of Kuala Selangor through Tanjong Karang, Sekinchan, Sabak Bernam to Hutan Melintang. In this town you'll turn to Bagan Datoh. After about 2 km the road turns to the right: the coastal road to Bagan Datoh. There is a sign on the left side of the road just before the turn. Near milestone 32 km you will see a sign with "Kaleebso" Here you must turn left. Follow sign to point, where you can board. That is just next to a small Chinese temple. 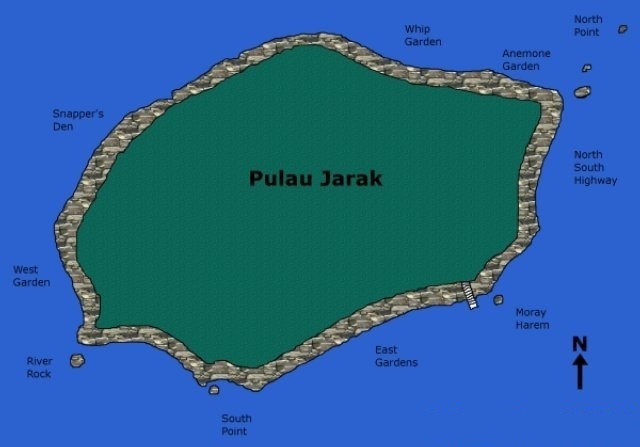 The boat trip to Pulau Jarak takes about 4-5 hours.